WASHINGTON, Oct 4 2013 (IPS) - Israeli and Palestinian negotiators returned to the negotiating table on Thursday, ready to put claims by the United States that it will engage more forcefully in the negotiating process to the test. The talks, which paused for the meetings of the United Nations General Assembly, have been struggling amidst Palestinian complaints of Israeli foot-dragging and the lack of U.S. participation. Yet for all the enthusiasm around the revived peace talks, there remains considerable doubt about the prospects for ultimate success. Yousef Munayyer, executive director of the Jerusalem Fund, a non-profit organisation working to raise funds to aid the Palestinian people, believes it unlikely that a permanent agreement will be possible. “Ideally, all parties would like a comprehensive agreement, except Israel wants one on their terms, the Palestinians want on their terms, and the U.S. wants something that can stick,” he told IPS. Yet some see hope as dovish lobbying groups are gaining more prominence in Washington. The moderate group J Street appears to have overcome attempts by more hawkish pro-Israel groups, such as the American-Israel Public Affairs Committee (AIPAC), to marginalise it. This week, U.S. President Barack Obama dispatched his vice president, Joe Biden, to speak at J Street’s annual conference and rally its supporters behind the peace-making efforts of Secretary of State John Kerry. Biden’s appearance, along with those of Obama’s special envoy Martin Indyk, Israel’s lead negotiator Tzipi Livni and Israeli opposition leader Shelly Yachimovitch, as well as House of Representatives Minority Leader Nancy Pelosi, offered strong evidence that J Street has established itself as a significant force here. “It’s become an accepted notion that there is not only one mass movement lobbying org in DC, which is AIPAC,” Ori Nir, spokesperson for Americans for Peace Now (APN) told IPS. Indyk, a former ambassador to Israel and a top Middle East policymaker under former President Bill Clinton, believes there is a real chance for success in the current talks. 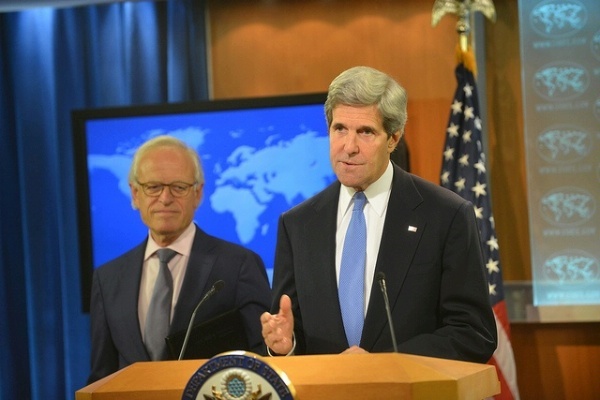 “We’ve agreed to intensify the talks, and the U.S. will increase its involvement,” Indyk said at the conference. “All the core issues are on the table and our common objective is a final status agreement, not an interim one. However, Daniel Levy, director of the Middle East and North Africa Programme at the European Council on Foreign Affairs, and former senior policy adviser to Oslo Accords architect Yossi Beilin, expressed strong scepticism about the current talks. J Street’s president, Jeremy Ben Ami, laid out his vision for a two-state solution, emphasising that both sides would have to make sacrifices. On the Israeli side, this includes sharing Jerusalem and evacuating some settlements. On the Palestinian side, it means accepting a de-militarised state, which many Palestinians see as a denial of their full sovereignty, and acknowledging that virtually no Palestinian refugees would return to Israel, a key Palestinian national aspiration. “The two-state solution is the only solution for the Israeli people and the Palestinian people and the only way we can secure the future of the region for all their children,” Ben-Ami told his supporters. Asked by IPS if he was concerned that the proposed solution might not prevail in referendums, which both the Israeli government and the Palestinian Authority have conditionally set as requirements for any final agreement, Ben-Ami said, “The publics on both sides have hardened their positions in the last 20 years. So the selling of a deal is harder than it was. But Husam Zomlot, the executive deputy commissioner for international affairs of the Palestinian Authority, spoke passionately at the conference about the rights of Palestinian refugees. Zomlot cushioned his point by indicating that his own father would not choose to physically return, suggesting that many Palestinian refugees would feel similarly. Still, this issue seems far from easily resolved.